What could be better than hunting for treasure-sized chunks of fudgy brownies, rippled throughout your ice cream on a hot summer day? Well how about if we make that peanut butter ice cream… anything peanut butter is automatically bumped way up on my comfort foods list. So a dairy-free, refined sugar-free, and no churn ice cream with those two components? OH, YEAH. 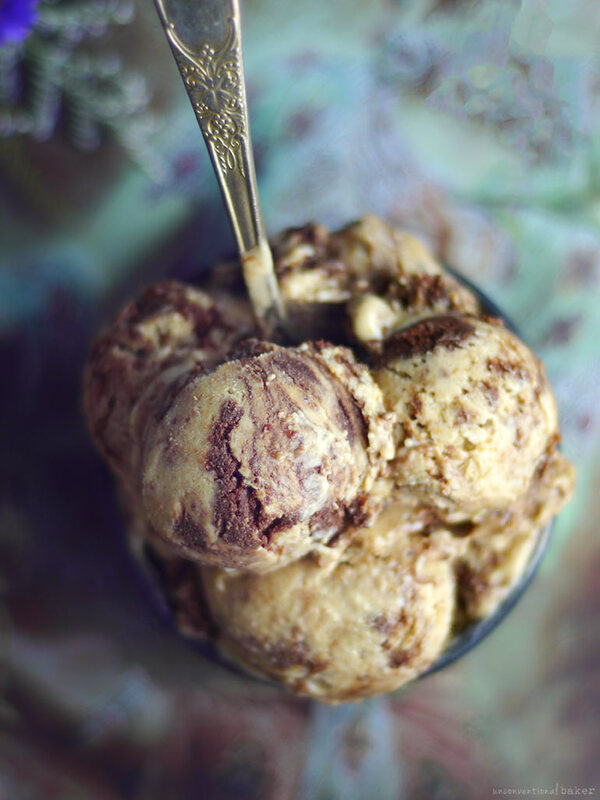 Peanut butter and nut-butter based ice creams are always a fave because they’re super easy to make and turn out delicious each time. 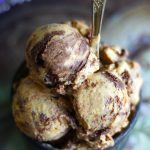 One of my favorite go-tos in that respect is this oldie peanut butter chocolate chip ice cream recipe. But somehow I felt like taking a different turn with this recipe. I often make banana ice cream with the addition of peanut butter, so decided to go with bananas in place of dates. And then immediately felt like adding some good brownie bits into it — when you taste it you’ll see just why — it just makes sense! Your taste buds will thank you. The best part is that there’s no baking involved for the brownie fudge bits either, yet the swirls and chunks of them throughout will fool just about anyone into thinking this ice cream is nothing short of being filled with delicious chocolatey brownies. The ice cream itself is super creamy by the way. The photos don’t do that part justice. Sadly my ice cream scoop broke midway through trying to snap a few photos (great timing..), so did my best with a spoon here, but honestly if you love peanut butter and brownie chunks in your ice cream I know you’re going to LOVE this. 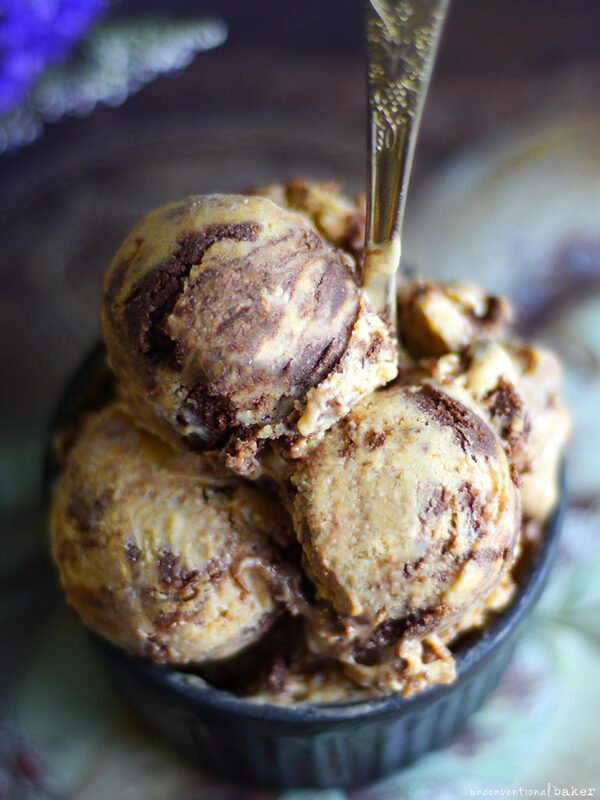 No-churn vegan peanut butter ice cream with swirled chunks of rich, chewy brownie. So good! 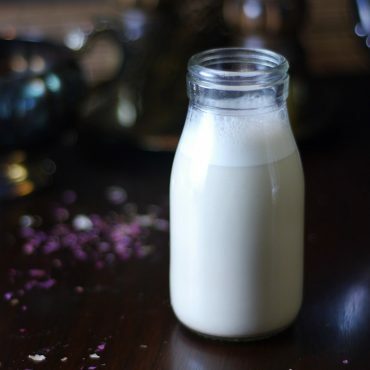 Gluten-free and no refined sugar recipe. Process all fudge chunk ingredients in a food processor until the mixture firms up into a consistency resembling brownie bits / chunks / dry brownie batter. Scoop out onto a plate and loosely break up the mixture with a spoon into finer pieces if desired (though definitely leave some larger chunks too for texture). Blend all ice cream ingredients into a completely smooth consistency in a power blender (use your tamper if using a Vitamix)(note: fresh bananas will blend easier but the ice cream will take a bit longer to set, which is why I used frozen). Transfer ice cream mixture into a container. Add the fudge bits and fold them in with a spoon to distribute throughout the ice cream. Freeze for 4-5 hours to let it set, scoop out and enjoy! Insane. Genius. Incredible. And I am only just putting into the freezer!! 1st, I generally detest coconut flour, after so many failed recipes that I’ve had to toss. Aside from its generally overpowering filthy taste & dehydration power. This recipe for brownie/ fudge chunks was far from it !! Again, genius. I am so impressed!!!! I halved the recipe cuz I was scurred.. but luckily it’s only ALL for me & so fast n EASY!! Also planning to knock out your pecan cheesecake as soon as I nab me a 6” pie glass this week. Thanks oh so much!! Hi Brooke. Thanks so much for the awesome feedback. And yeah, I hear ya on the coconut flour lol It’s definitely an odd ingredient, but works really well here. 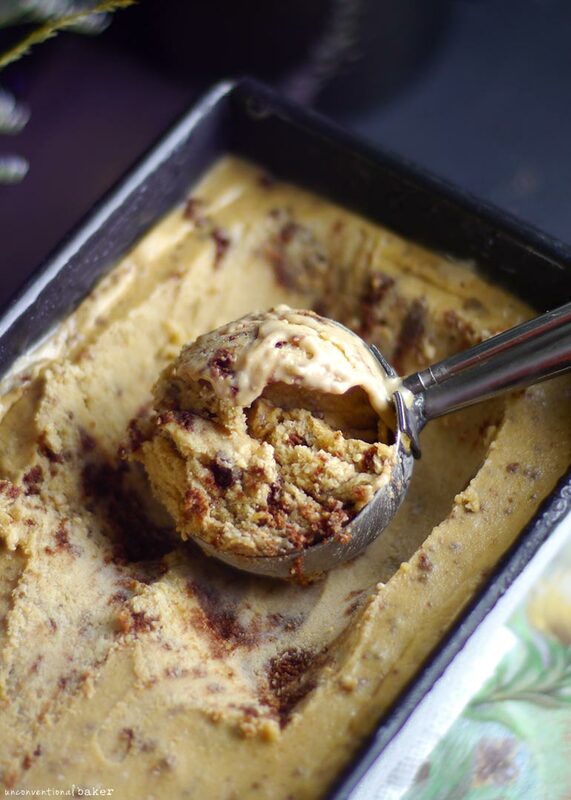 This ice cream base looks amazing, and I love the ingredients for the fudge base! 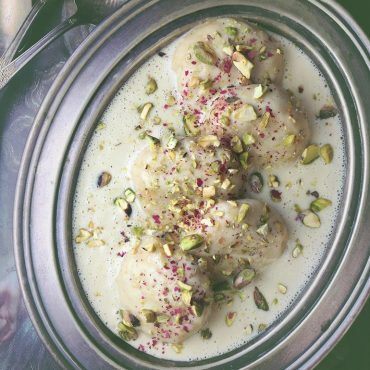 Definitely had to Pin this recipe because it looks wonderful! The brownie swirl is my favorite part. I could hunt for the chunks / bits all day ?? Haha. Yes, I’m a little more than familiar with that fatal valiant effort to hunt down the mix-ins ?? ?